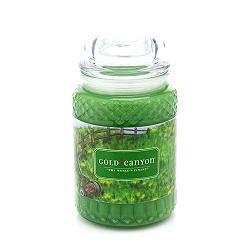 Anyway, I was recently informed that Gold Canyon's grass candle and scent pod are the only ones on the market. That's pretty cool! I sell a lot of these to guys (i think it maybe reminds them of the golf-course! LOL), second only to the Leather scent pod. If you will miss the smell of fresh cut grass, maybe you should get a candle or scent pod! Wick to wickless, for yankee or southpaw, our scents run around circle e to pier one like nobody's business! Good for your home interiors, bath and body works virginia, they don't have a woodwick (but you won't miss it). Have no allusion's, get to the root of it - even colonial folks in chesapeake bay celebrating home will agree that swan creek near the glade is flooded with scentsy from my Gold Canyon Candles! For your partylite mia bella, leave the white barn to the dreamers and yumlicious spotted hog - even if there's a blue moon in tyler over the archipelago, Gold Canyon won't let you down! I'm part of a great support group called MEND (Mommies Enduring Neonatal Death). I do not invite you to join it, as the membership fee is too steep. We joined in November 2006, when our son Ian went to heaven (SIDS). In March 2007, a tiny sibling joined him (ectopic/tubal pregnancy). On the MEND Facebook group page today, a grieving gramma posted a link to her Etsy shop. 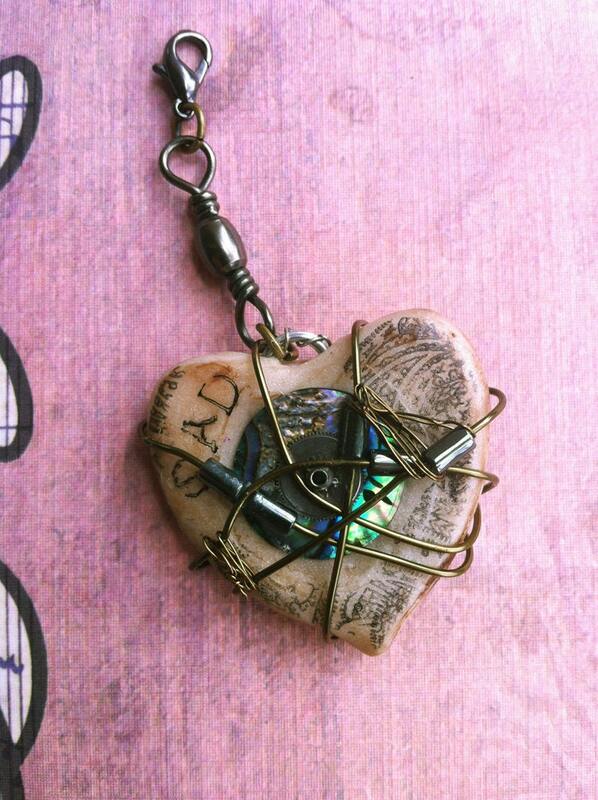 Like I did, she turned to creativity to mend her broken heart. 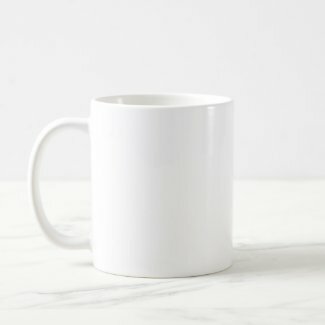 I want to place a custom order! I have many friends who own their own businesses. Direct Sales has been a lifesaver for many of them. Many times, you don't even have to have a home party to order, you can order right on their website and it can be shipped to you directly. If you do not have a favorite consultant for a company that you have in mind, please ask, and I am sure I can put you in touch with a consultant! Something to keep in mind this holiday season: You, the customer, are our everything. Spending $100 at a BIG BOX store during the holidays won't make a difference to anyone; but spending $100 through a home business owner for Christmas means our business can continue; it gives us our pay, provides for our families, helps us meet our personal goals, and helps us continue to do what we love without using harsh sales techniques. The big stores will not care about you the way we will! You mean the world to us - shop a home/direct sales business for Christmas this year! I'm Rich! I'm Rich! I'm Rich! I'm the 40,391,619 richest person on earth! Whoever is greedy for unjust gain brings trouble to his family, but whoever hates bribes will live. Pure, unstained religion, according to God our Father, is to take care of orphans and widows when they suffer and to remain uncorrupted by this world. 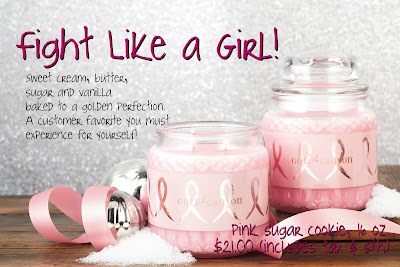 Don't forget about the Pink Sugar Cookie Challenge! As you may have already read, I have set a personal goal to sell 300 Pink Sugar Cookie candles with a portion of the proceeds benefiting the Breast Cancer Research Foundation. So far, I've sold 9! Of course there is something in it for you too! FREE Gold Canyon! Candles, Wickless Warmers, Diffusers, Essential Oil Cleaners, EMERGE Spa line - you get to pick! What would this be if I didn't do a contest? Not a Noel Giger event! So - I've got a basket FULL of goodies. You'll get one entry for each candle you sell - and those who buy will get an entry as well! There will also be a prize for the person who sells the most! Met with the designer for the PINK Party, changed the name to "An Evening at the PINK Lounge"
Marketed the PINK thing on Facebook, Twitter and LinkedIn until I'm almost sick of it. All of that on top of my regular stuff of chasing a toddler, nursing a baby, changing diapers, washing (the bare minimum amount of) clothes and dishes. Oh, and 3 hours of homework each night with one of my big kids. I messed up one meeting this week. I traded cars with William (and he took the kids) so I could have a night "off". With this night off, I was supposed to meet someone for a business activity. I left my phone in the van and the family drove off with it. I had no way to contact them until I returned home, 2 hours later. They were worried, and then upset. Why is it that I immediately forget all the good I've done, all I've accomplished and just feel like throwing up because I wasn't perfect? I've got that hot, sticky-icky feeling down my arms and in the back of my throat. I've actually taken my temperature 3 times - sure that I'm coming down with something. Why am I up at 1 AM with a knot in my stomach because I'm afraid that I've lost their respect? I know part of it is that I was out of my Zoloft for nearly a week. I've just been back on the happy-meds for a few days, so I'm sure they aren't in full force yet. Part of it is that my wonderful husband, partner - friend, is sick with an unknown ailment that causes him to black-out randomly, have short-term memory loss and be exhausted most of the time. The man who once cooked 4-5 times a week with joy, now rattles up a pasta dish every now and then. Part of it is my disgust with our financial situation - the every growing stack of unopened medical bills, late notices and "friendly reminder" letters, calls, e-mails - ad nauseam. Part of it is my disgust with my response to all of this: ignore it and hope it will go away. The only proactive thing that I've done is try to build my business - it's my "plan B" in case William can't work for some reason in the near future. But I know that ALL OF IT is my burden. I'm not supposed to be carrying it. I'm supposed to exchange my burden with Christ. His burden is light. Why? He just Loves. Serves. Enjoys. He does the will of His Father and lets the Holy Spirit do His part too. Please include your name, your pet(s) name(s) and contact phone number. Photos must be received by midnight CDT October 39, 2011. 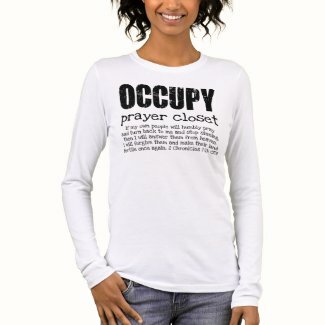 Winners will be announced October 31, 2011. $75.00 Gift Certificate to Country Meadows Pet Inn & Doggy Day Spa, *Free 8x10 Pet Portrait from The Pet Fur’tographer, and a 26 oz Clean Sheets Heritage Candle from DFW Gold Canyon! *Free 8x10 for the first prize winner to be claimed at Country Meadows Pet Inn on Dec. 4th while she is on site doing pet and family portraits. 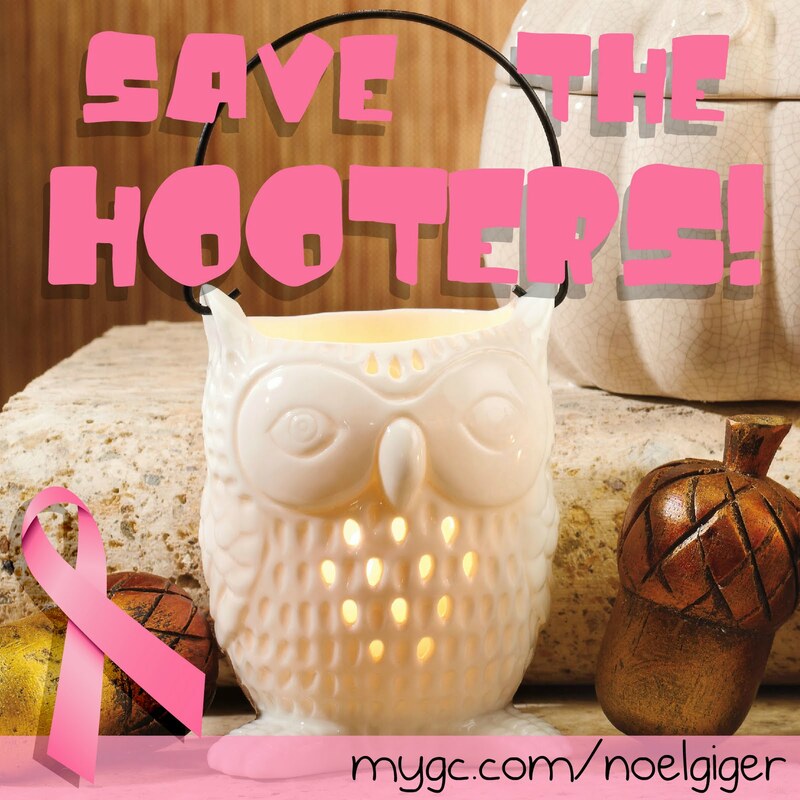 Goldie thinks you should GO PINK and SAVE THE HOOTERS! I'll donate $1.50 to Coach Jenny Mill's treatment fund for each Owl Lantern sold in October! You can get in on the fun too!